We offer a full Irish or Continental style breakfast for our guests. There is a Request form on our Contact Us page. Simply fill in your preferred dates of stay and select your rooms and number of guests. We will contact you via email as soon as possible. Our breakfast menu is available to view online. Click Here. We will also endeavour to cater for special dietary requirements, please let us know prior to your arrival and we will let you know if it's possible. Noel and Briege welcome you to Fairlawns B&B - Dundalk. 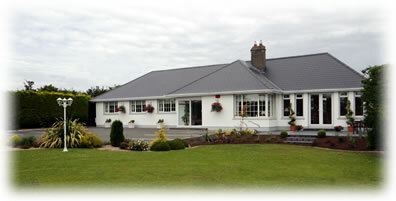 A modern guest house with excellent food, accommodation and hospitality. We have secure parking and large tranquil gardens for our bed and breakfast guests to relax in during the spring, summer and autumn months. Wi-Fi Broadband is available for free to all our guests. We are 2km from the centre of Dundalk with its shopping centres, restaurants and nightlife and 40 minutes drive from Dublin Airport and 50 minutes from Belfast International Airport using the nearby motorway. We have pictures of our accommodation available. Please click on our Accommodation link to view.